You are being redirected to our new blog! Travel Executive has moved to another, more beautiful website. VISIT NEW TRAVEL EXECUTIVE HERE! Want to see all the new reviews of our one-month July trip throughout Southern Europe and the Middle East? 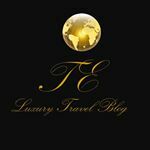 Then head to www.luxury-executive.com and enjoy a more attracting design and blog. Check it out and let us know your thoughts. We love hearing from you! Nestled on the real bottom of Lake Garda, in the town of Salò, the Villa Arcadio is located in one of my favorite regions of Italy - Lombardy! Not only famous for its excellent scenery, lakes, cities, no - also because of its excellent food, especially Pasta and Risotto (That's something I learned in Milan.). Although we were driving towards Brescia, away from the lakeside, we never missed the Lago di Garda - you are looking towards the lake from everywhere in the villa. After driving up the driveway, we immediately arrived at the Villa Arcadio. This means the hotel is near the main street, which can cause some noise on the pool. We were greeted by the two very quiet and well-behaved house dogs and one nice front desk lady. Check-in went really smooth, without even asking to do the paperwork (she just collected our passports) and within 5 minutes we were standing in our Junior Suite, flashed by the amazing 90 degree views of the lake, the town and the hills surrounding Lago di Garda. The rooms are mostly on the cozy side - that's the reason why there is no real open living room nor a sofa inside our Junior Suite. There is also a higher category in the house, the Suite with separate living- and bedroom - honestly we haven't spent much time inside our room as the lake is one of the most wonderful in Europe and Lombardy has got a lot to see, eg. Lago di Iseo, Brescia and Bergamo or you change regions and head to Verona and the other side of the lake - being in Veneto. So, get out of bed and discover Bella Italia! As already mentioned, our Junior Suite had lake view, but otherwise the room was designed in a minimalistic style, offering two lounge chairs, one writing desk with television (many TV channels in german and some english ones), a minibar with affordable prices and a comfy King bed. The bathroom was generous, although it only had a walk-in shower and no tub. Toiletries were not branded ones, although not bad ones - with olive oil of Tuscany. A personal wish of mine would have been a working air condition - I guess they turned it off due to low season (normally it is not that hot in April, but the room was under the roof and pretty hot during the sunshine all day). The pool looks really nice on the pictures, so I did expect a slightly differently prepared garden: Unfortunately the lawn wasn't mowed, which is not a problem at all - it would have looked lovelier while enjoying the amazing lake views from the infinity pool. Another issue was that we couldn't find a towel at the pool - which was because the hotel was still in low season and not yet operating full. The pool is opened from April to October but is not heated, so you need to be really tough when you want to swim in April or early May! We weren't as tough as we were at the Arts Barcelona - maybe because it was already 5 pm, although it still had 23 degrees celsius. Dinner and breakfast are served in the wonderful dining rooms just next to the pool and the bar and the lake view terrace. We had a wonderful evening with excellent dishes, from a wonderful amuse bouche to classical italian "Battuta" (kind of steak tartare), scallops carpaccio and risotto of broccoli and parmesan cheese. Furthermore we had sole with spinach (I'm not into spinach) and excellent sorbet of grapefruit.For wine pairing we had an excellent wine from the nearby Valpolicella. Throughout the evening we had two servers who where very kind and attentive, always willing to offer everything we desired. Breakfast was taken on the terrace and we could choose from a selection on the buffet (typical italian with homemade bread) and a menu with egg meals. We took scrambled eggs and omelette, which was both very good. It's hard to beat an italian cappuccino! Although the dinner was truly excellent, everyone is so welcoming and personal and the Villa represents completely my taste of Interior Style with CasaMilano furniture, the true highlight simply was the hotel's own "Riva Aquarama Special". Having had an appointment at 11 am, we left the hotel 10 minutes before to arrive on time in the center of Salò. As soon as our driver arrived, he began driving the very elegant wooden motor yacht. Our tour started with a view of the pedestrian area of Salo then we drove along the western side of Lake Garda until we arrived in Gardone Riviera. From there we could spot the Grand hotels of this famous tourist town. Soon after we were driving further up north to Gargnano where our skipper showed us the world famous Grand Hotel e Villa Feltrinelli - home to superstars and upscale celebrities such as George Clooney. From there we crossed the whole lake and after 20 minutes we reached the east side of the lake. There was a old villa and another ancient hotel with a wonderful café. Before our tour came to an end, we passed by a private owned island with an impressive and totally chic luxury villa. It was a really special experience and I would say THE top reason to choose Villa Arcadio for your next trip to Lago di Garda. Personally, we would like to recommend the Villa Arcadio to everyone seeking for a perfect luxury hideaway with a truly personal touch and real costumer care. While it is just that perfect for couples and single travelers, we can imagine that children can be bored easily(According to one of our readers Villa Arcadio is truly child-friendly and perfect for families as well). We were guests of the Villa Arcadio. All our reviews expresses as always our own opinion. We would like to thank the owner Mrs. Jaana Nakari for the generous invitation and the wonderful stay. 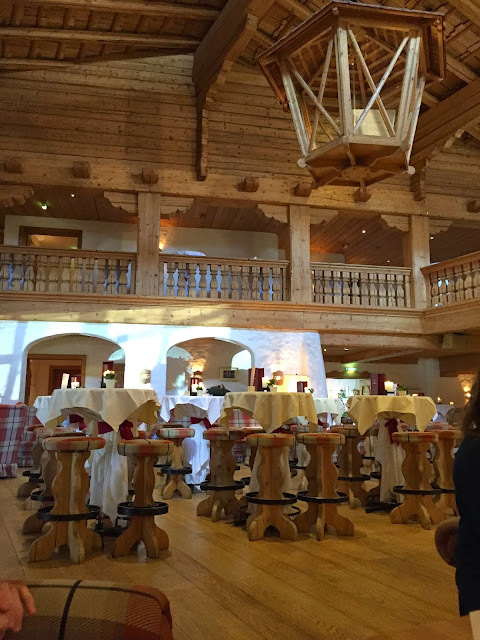 What the Hotel Byblos is for Saint Tropez, the Stanglwirt is for Kitzbühel. Situated on the bottom of the Wilder Kaiser mountain range, the Stanglwirt boasts an excellent view of one of the most amazing mountains in Austria. After a personal greeting with an excellent glass of rose sparkling wine, we immediately felt home. Inside the vast bar area, there are huge windows overlooking the horse riding hall - a truly unique facility of this hotel. After we finished our welcome drink, the nice front desk lady Helga accompanied us to our suites. As a surprise of the house we got one large Junior Suite and an even more amazing Sonnen Suite. Both, the Junior as well as the Sonnen Suite had a separate living and sleeping room with a wonderful marble bathroom, walk-in wardrobe, fire place and balcony overlooking the "Kaiser Gebirge". While the Junior Suite was equipped with a jacuzzi with glass windows into the bedroom, the view was going to the mountains and towards the spa. As one of the largest suites in the whole resort, the Sonnen Suite was truly breath-taking, offering 180 degrees views of Going, the Kitzbühler Horn, the Kaisergebirge and the resort. Furthermore the living room was very large, like the bathroom was. Firstly I would like to point out the Nespresso coffee machine with four capsules free of charge, which is truly amazing - although it is only available in the Imperial Suites. In addition to my perfect morning coffee, we received a very warm turndown gift - a platter of homemade pralines. The toiletries were by Pure Herbs, a pretty common line in the Tyrollean hospitality. I could imagine that Bulgari or Blaise Mautin amenities would be way better in these luxurious bathrooms. The beds were extremely comfortable and unusually huge for Austrian standards (in size of length and broad). Unfortunately we had to experience that the dinner is not that amazing as the rest of the Stanglwirt. While the quality of the food at lunch was relatively good, the offered Gourmet Menu was kind of disappointing for the price and category of the resort. The scallops did just taste like coating and the real taste of the scallops didn't get through. From our point of view the lobster was not delicate. The side dishes were quite good and the service average. You, as a guest, could feel the cold atmosphere the staff members have to each other. The first two courses were not served, instead they were available to pick up at the buffet - which didn't really disturb us. After a heavenly night, we went for breakfast. My first believe was that I should have better ordered in-room breakfast in our amazing suite with this amazing view. For a few seconds, nobody was there to lead us to an available table - our table of last night was occupied due to a birthday celebration. So the restaurant manager himself - showed us to an available table between the service office, hallway and buffet. Not really bright and relaxing. Surprisingly the buffet area was full of other guests, and I felt like in a all-inclusive club in Turkey or Egypt (although I have never stayed at such, just imaging how it would be!). Nevertheless the buffet was huge and the quality of the products was excellent. They offered an open kitchen where someone can order eggs, pancakes and crepes. Our coffee was good as well and although the restaurant was way too overcrowded there was always a staff member around to clean our table, bring fresh coffee and pick up dirty plates. Again (like at the Stock Resort), the highlight of our stay was the amazingly vast Wellness and Spa area, spreading over 12.000 square meters. Offering everything a discerning luxury traveller like us could wish: refreshing 25 meter sport pool, a vast 200sqm sole pool at 38 degrees celsius, a really cold mountain lake next to the sauna, as well as a indoor mountain pool with a connection to an outdoor swimming area. I can proudly say that this is the most spectacular wellness area in the Tyrol and definitely one of the coolest in Austria! Made out of real stone of the Kaisergebirge, the spa completely represents the local area. My favorite place was the hot outdoor sole pool with waterproof pillows on top of the underwater loungers - I could have stayed forever. We didn't have time to book a treatment, but we made it to each and every sauna and steam bath - and there are plenty of them! From 30 degrees to 110 degrees celsius, the Spa of the Stanglwirt meets really every guest's taste. We were guests of the Hauser Family and the Hotel Stanglwirt. All above written expresses our point of view and has not been influenced. Nestled above the lively town of Mayerhofen, the Stock resort is perfectly situated on half way between the Hintertux glacier and the main valley. Upon driving up the windy road from Mayrhofen, we approached the town of Finkenberg where we soon ended up driving through the main entrance of the Stock resort. We were welcomed with a nice smile, refreshing hot towels and a glass of Daniel Stocks (the owner and managing director) "Mount Stock Sparkling" wine. After leaving the car keys at the font desk, they arranged everything that all our bags and stuff were brought to our suite. Melanie, the nice front desk lady accompanied us to our Suite Tirol, a lovely suite with typical tyrolean furniture, fire place, vast balcony, walk-in wardrobe, separate toilet and bidet, as well as a spacious and bright bathroom. The comfort of the room was really good, although it is not my kind of style - I prefer the new Alpine Lodge Suites or the "Residenz Suites". While many wellness resorts in Austria offer a free minibar, the Stock resort wants to offer a more extensive selection including sparkling wine, soft drinks, water, snacks and red and white wines. Therefore there is a charge for each item in the minibar, but they have a bar of free unlimited soft drinks in the restaurant area! The restaurant area is styled in different ways and you are seated according to availability. We were seated in a part where there were no kids - really much appreciated. Throughout our stay every staff member was extremely friendly and efficient, they were always happy to asisst and went beyond our expectations. In terms of culinary, the Stock resort offers a six course menu according to their website. We had to experience that the first two courses consist of the spread and butter as well as salad from the buffet - something we were not used to at previous stays (eg Alpen Palace, Castel Fragsburg). Maybe this is not the case during Gala Dinner where all courses are served. The quality of the food was very good, one evening we got a fillet of Black Agnus beef and the second day we had a fillet of trout and pork fillet. As the highlight of the Stock resort, the amazingly vast Wellness and Spa area is one of the hugest we have experienced so far. Spreading over 5.000 square metres, this spa offers everything you could dream of. Our favourite places are the new 35 metre panorama outdoor pool (heated to 28 degree celsius), the hot outdoor jacuzzi next to the sauna area, the heated indoor sole pool in a rural looking cave, as well as the refreshing mountain lake situated in a cavy room, at a temperature of approximately 20 degrees celsius. In addition to the pools there are plenty of saunas, steam baths, relaxation rooms with water beds and an area with a small snack buffet and coffee. During our stay, the resort offered a lot of activities with the retired ski star Hans Enn. Beside sport activities, there were also a lot of family, spa as well as culinary activities. We took part at the wine safari through Austrian wines in the wonderfully styled wine cellar. All in all the Stock resort is a truly amazing place for families, couples and friends seeking for a cool wellness and sport week. The service is great, the rooms very spacious and the spa truly world class. We can highly recommend this place. We were guests of the Stock Resort Finkenberg. This review has not been influenced and expresses our personal opinion. After a heavenly night at the impressive Arts Hotel, we were ready to discover the beauty of the capital of Catalonia. 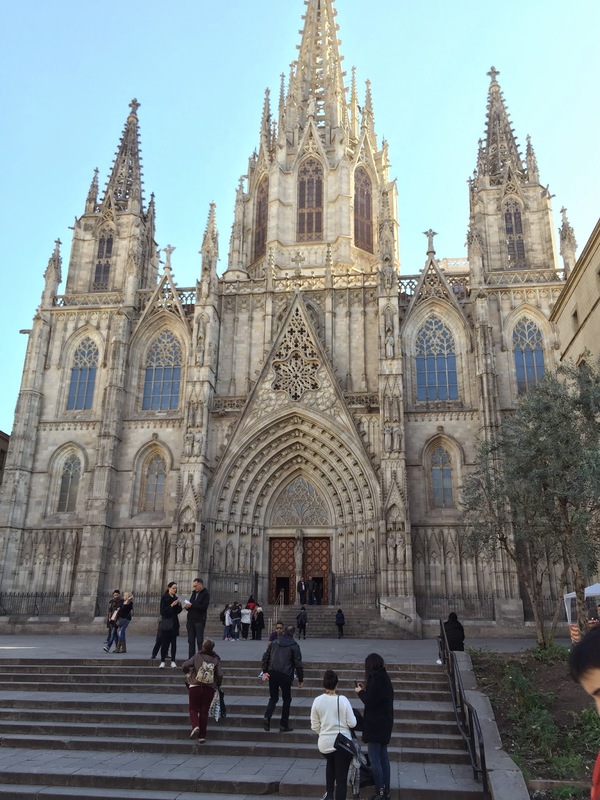 We organized a private tour through Barcelona Experience before our departure. Our guide Gaston was already waiting at the Column of Christopher Columbus, one of the most hidden tourist attractions in Barcelona. The guide took us up to the top of the column by a very small elevator, from where we had an impressive overview of the gothic quarter, Barceloneta (the beachside), the uphills, Las Ramblas (which is starting at this column), as well as best views of our hotel, the cathedrale and some other nice churches we visited afterwards. We immediately took the Las Ramblas in direction to the Placa Catalunya, where our guide told us the history behind this amazing shopping street - riminding of a very nice and more relaxed copy of the Avenue des Champs-Élysées. At the very mid of the original Las Ramblas (going from the Column to the Placa Catalunya), we entered the gothic quater with its narrow and shady streets, like a labyrinth. After a few turns we ended up on the most wonderful city oasis I have ever seen - the Placa Reial with lots of cafés, restaurants as well as original flamenco and jazz clubs. Before we headed back to Las Ramblas to see La Boqueria market, we strolled further in the Gothic quarter and visited the Basilica del Pi - a typical Catalan church with a wonderful and tranquil square in front of it - and a pine tree in the middle of this enormous metropole. In the Boqueria market we found ourselves passing by the freshest fish available - the lobsters and king crabs were still alive! There were plenty of exotic products we never imagined to get in Europe - it is a heaven for foodies of all kind. Back in the Gothic quarter we visited the old ruins of Barcino - the roman name of the original Barcelona. Following the imaginary roman roads, we ended up in front of the old gate to Barcino - right next to the impressive "Cathedral de Barcelona". Having passed this monumental highlight we followed our excellent private guide Gaston, who was now leading us through the really heart of the gorhic quarter, passing by the oldest and most wonderful buildings of Barcelona - of course also the Placa del Rei - the old King's Court. Our last stop was on the most central square - the Placa Sant Jaume, where the government of Catalan and the city hall of Barcelona are situated. This was the last stop of the tour and the ending. Actually we expected a tour with lots of facts and therefore kind of annoying, but Gaston went beyond all expectations and convinced us from the complete opposite. Thanks, it was perfect! We were really impressed of this 2 hours tour leaded by Gaston and organized by Barcelona Experience, and we can only recommend this experience to every traveler going to Barcelona - you won't regret it! Our Private Guided Tour was sponsored by Barcelona Experience. The above written review expresses our own opinion.